The Sensational Life and Death of Qandeel Baloch by journalist Sanam Maher not only helps us explore in great detail the titular subject beyond her videos and appearances but is a scathing commentary on Pakistan’s increasingly dangerous online world, the inherent patriarchy and the culture of murder in the name of honour. Qandeel Baloch, 26, was no ordinary woman; we all know that. Or should know that. She loved to perform. She loved to sing. She did other things but she didn’t do it with a twisted heart. Murdered in July 2016 by her brother Waseem Azeem, who confessed to the heinous crime done in the name of honour, she was also a deeply devise figure. Anointed as the woman who celebrates her body and sexuality in death, she was just as frowned up, nah, hated on for the videos she made, some random, others echoing a greater loneliness, if you could get past her demeanour that was both seductive and surprising, and so unpredictable for a Pakistani woman in recent decades. After all, we remain a sexually closed society with traditions defying humanity itself and when that happens, what hope do we have for someone like Qandeel who refused to live by anyone’s rules other than the ones conjured by herself while critiquing the hypocrisy that is so prevalent? The greater question still, one that Maher addresses in the author’s note is this: is there more to the woman than what was sketched in the feeding frenzy that followed her, both before death and afterwards? In truth, as Maher notes and as the book suggests, “there are many notions about Qandeel Baloch,” and perhaps those readers who followed every story with precision may have some understanding of who she was but this book remains relevant for several reasons. It not only takes us back to Qandeel’s past, which included having the daylights knocked out of her by her brother when she was in the third or fourth grade, but vividly introduces us to the many characters that made up her life while taking us across Pakistan. Maher also meets Qandeel’s parents, who in the aftermath of her death, in October 2016 tell one reporter that they had to resort to begging and were evicted from their home in Multan. Because, it was Qandeel who paid for everything including their rent. 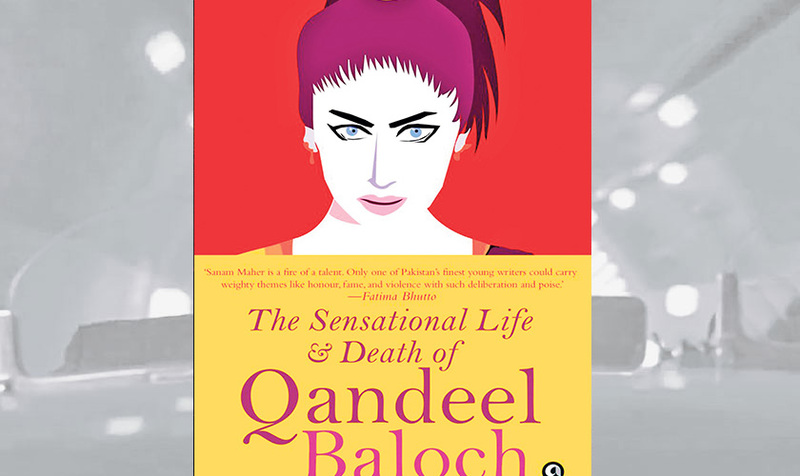 The book captures Qandeel’s relationships, with her parents as well as the brother who murdered her and whose every whim she complied with, including buying him expensive phones. It also investigates the circle of media coverage following Qandeel even at her funeral in her village and the legal system. The reportage is excellent while the writing is both sharp and melts your heart. And it also goes beyond the persona of Qandeel Baloch – her real name is Fouzia Azeem - to the time she was married at 17 and endured physical torture and was forcibly taken to her husband’s home, by her mother, until she ran away to a women’s shelter in 2009. And Qandeel Baloch could not stand it any longer. As the book traces her story, it also makes a case for the treatment of those with privilege versus those without, the leering treatment at every turn, and the irony of the fashion world that exists beyond Lahore and Karachi. The book also makes one wonder about the voyeuristic culture we live in, where threats in the online world are made against hundreds of women with no shame. It never makes Qandeel into a caricature as did so many anchors who invited her on their shows, or patronizes her in the way she was on the now infamous Pakistan Idol audition that went viral. The book also covers Arshad Khan and speaks to him about being thrust in the limelight for his looks, a reality he never understood, the incredibly moving story and spirit of Nighat Dad, who founded The Digital Rights Foundation in 2012 and is currently representing Meesha Shafi against one Ali Zafar, and the Deputy Director of the Federal Investigation Agency’s cybercrime wing, Noman Bodla, among other conversations. Qandeel Baloch became bolder with every video and every TV appearance, and that was unacceptable to so many in Pakistan that when she was brutally murdered, the comments that followed were not only from men but women as well, who couldn’t understand a woman calling out the hypocrisy, patriarchy that defines life in Pakistan. This is a must-read book because it immortalizes Qandeel Baloch in the only way she should be: a rebel, a mystery, a beautiful one at that.